This is the present and the future of the digital currency, but many people still love talking about it rather than trading it. With the help of our award-winning MetaTrader 4 Supreme Edition, traders should be able to enjoy ETHUSD CFD volatility and take advantage of the digital currency and superior technology we are delighted to offer. It's now possible to trade cryptocurrencies with Admiral Markets, including the ETHUSD CFD. Traders can access ETHUSD CFD and other crypto pairs using both the MetaTrader 4 and MetaTrader 4 Supreme Edition plugin. Open up the cryptocurrency chart (ETHUSD). Also, all of the additional add-ons for the MetaTrader 4 Supreme Edition are now also available for the latest version of MetaTrader 5 Supreme Edition. First of all, we need to know that cryptocurrency markets are much more illiquid when compared to equity markets, meaning that larger market players can cause larger movements. Smart money usually buys lower and puts sell orders when the price is peaking. Thus, traders should avoid buying high. 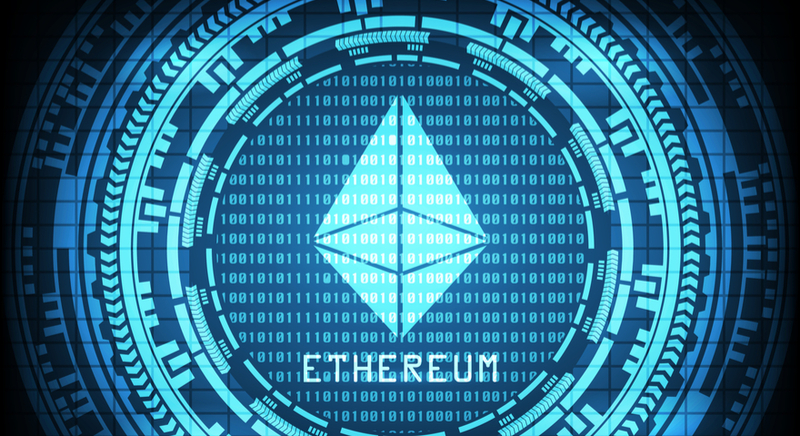 Ether is subject to a much wider range of price fluctuations compared to the currency (Forex) market. Investors have been pouring capital into the market, betting that consumer demand will propel future growth. At this point, all the cryptocurrencies, including our Ether CFD, are subject to significant speculation backed by very little historical data, which makes this asset class very volatile. If you want to trade Ether CFDs and other cryptos, you need to get used to volatility. For that reason, you might want to download the demo platform first. You should also familiarise yourself with our fantastic Volatility Protection Settings, which can help you minimise volatility risk when trading. Current vs Historical Price: Trending or Ranging? 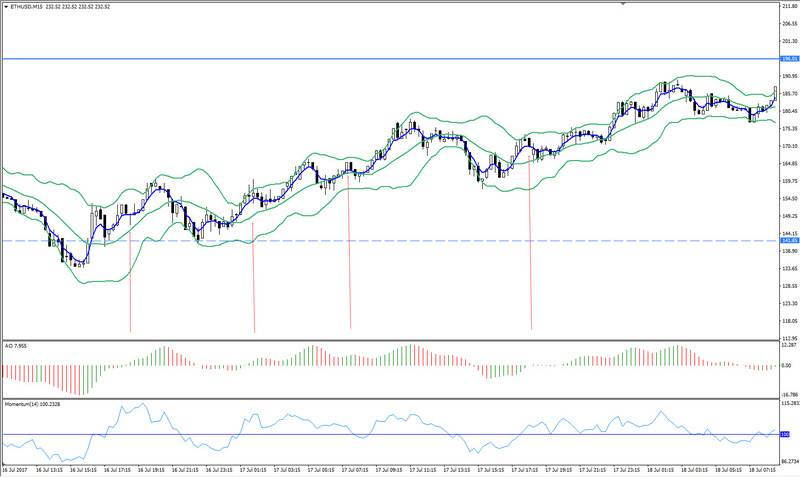 At this point, we can see ranging price action, where the price is trapped between the 404.00 and 134.80 zone. In May, the price enjoyed a steady surge of uptrend, whereas smart money started selling it in June. Since June 12, the price has been trapped in the downward channel. On July 18, the price broke above the channel. The price staying above will mean the uptrend should continue. To always stay up-to-date with the cryptocurrency price, as well as possible movements and trading opportunities, Admiral Markets offer free live webinars with leading professional traders and analysts. Which Strategy Should You Use to Trade Ether CFDs? Technical trading and proven tools should be applied when trading Ether, which in turn could be the basis for trading the Ether vs Dollar CFD profitably. Due to its volatility, scalping strategies should be applied if trading intraday. Those who wish to swing-trade ETH/USD need to be prepared for a bit of unstable price action, where steady profits might turn into losses in a split second. A "flash crash" occurred on June 21, when the price dropped from around 320$ to 10 cents. It has recovered since, but investors and traders definitely took a hit. Mr Adam White, Vice President of GDAX, explained that an investor placed a multi-million dollar Ether "sell" order at 12:30 p.m. on a Wednesday. The order size caused the currency price, already volatile, to dip. As we know, as the price grabs Stop Loss orders it creates additional momentum and huge movement in minutes or even seconds. Every close of a buy position is an automatic sell into the market and vice versa. Algos that trade the price followed the price momentum and the "flash crash" happened. Intraday scalping should be a safer bet, especially as it corresponds to "hit-and-run" tactics that can be successful in volatile markets, provided that you are on the correct side of the trade. At this point, buying the dips is a good strategy to trade the ETH/USD CFD. Enter long position once the fast black 4 EMA has crossed up through the middle Bollinger Band, 14 EMA (red). At the same time, the Chaos and Momentum should be crossing their zero lines, going up. Potential entry zones are shown as red arrows. Your exit position is executed when the Chaos Awesome Oscillator changes its colour (mostly for high-frequency scalping purposes) or at Admiral Pivot point. Stop-loss is placed below the recent swing-low. Proper money management is the holy grail of trading and, if applied correctly in a strong trending environment, it should theoretically make enormous ROI. Due to huge volatility, losses might occur as well, so it is extremely important to use proper money management. Market stability could be reached when power shifts from investors seeking to profit from price fluctuations to consumers actually using cryptocurrencies. When that happens, volatility should stabilise. Traders should treat crypto trading the same way they would treat any investment in the early start-up stage. Also, intraday traders should definitely be focused on major trading sessions as major trading centres provide the highest volatility in ETH/USD. Fortunately enough, our MetaTrader 4 (MT4) platform offers the instrument during major market sessions – 24/7. Ether is hot. The trends that are making virtual currency more popular appear not only to have lasting power, but to be a central aspect of future communications and finance. By this logic, it makes a lot of sense to trade cryptocurrencies. 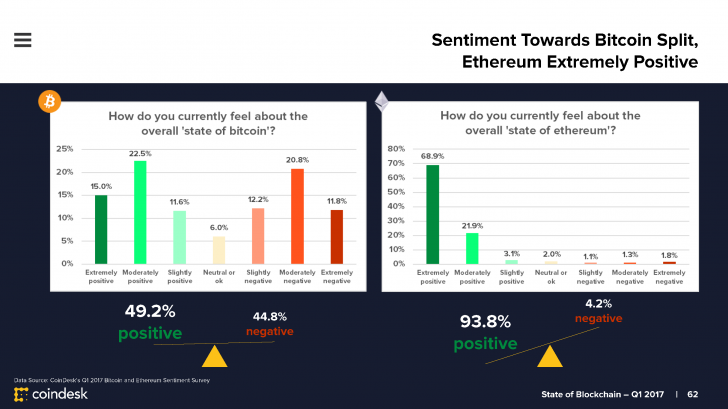 The diagram below shows that the sentiment towards Ether is extremely positive. We can say that trading the ETH/USD CFD currency pair could be a better option than investing purely in Ether, due to the huge volatility which may benefit intraday traders. The question with cryptocurrencies and Ether remains, which way they will go? Many investors believe that their price will increase. As Ether is more widely applicable and faster than Bitcoin, these beliefs might not be too crazy. The current traded volumes, however, are extreme, as we already explained, and began to take speculative forms. When we mention Ether and speculative trading, we need to say that the vast majority of cryptocurrency trading is pure speculation and the current utility value to users is close to zero. Not many people use blockchain protocols, opposed to many people who trade cryptocurrencies – one more reason to try trading Ether. We also might see regulations coming in terms of exchanging, issuing, and holding new coins. Ether and other cryptocurrencies might experience another hype when a total market cap of approximately $150 billion is reached. In addition to trading CFDs in ETH/USD, Admiral Markets also offers the LTC/USD, BTC/USD, XRP/USD and BCH/USD CFD currency pairs. To do so, traders simply need to download the software platform (MetaTrader 4), which grants access to the market and/or watch price action on a chart. The process is very quick, so you'll be ready to go in no time!